Pit Fighter Tycoon is a simulation of intergalactic Alien rivalry, where you abduct, genetically modify, drug and then force Humans into gladiatorial Fist-Fights. Usually to the death. But more importantly, to make loads of cash. You're a Tycoon after all! For more information, visit the Steam Greenlight Page: Here! And just like that, 5 months flies between Development logs. Definitely overdue! A lot has changed for me recently; I’ve moved to the other side of the world, spent some time living in a van and I now have returned to full-time employment at a games company. But the important thing is that development of Pit Fighter Tycoon has not stopped, and is still going on. Going forward, development will need to happen after work and on the weekends. Unfortunately this means that a 2018 release date for Pit Fighter Tycoon is just not going to happen. The last few months have been quite productive, as I’ve taken a look at how all the systems in the game interact - and found they didn’t do that well enough. The next few months are going to focus on really tying the existing systems together so work together as a whole. So, what’s new in the game? Previously, Pit Fighter Tycoon was a bit hands-off when it came to slave management. You assigned them to a trainer, watched them progress, sent them to fight and only ever really managed them closely when they were injured, or if you wanted to ‘upgrade’ them with new organs. A Slave’s injuries act as a hard cap for the amount of fatigue your Slave can recover. A single injury could cap your slave at 95% performance - not too harsh a penalty. But a recently brutalised Slave may only be able to recover up to 10%, ensuring they will get fucked up again if sent back into the Arena before they can heal. 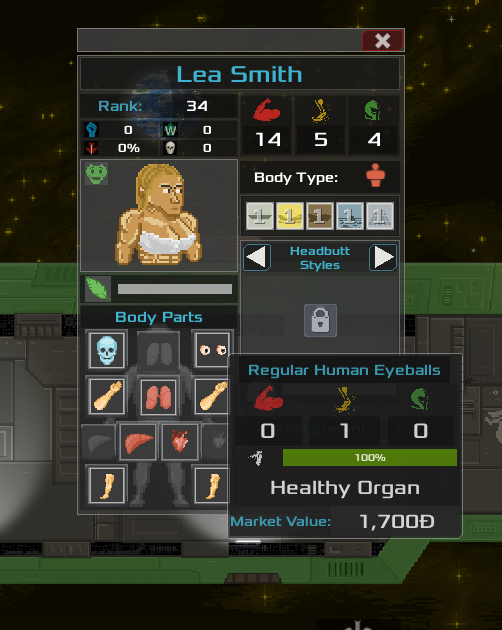 Injuries are now stored on individual organs, which is a huge mechanical change in the game. This means that a Slave’s heavily damaged organs can be swapped out with fresh ones. 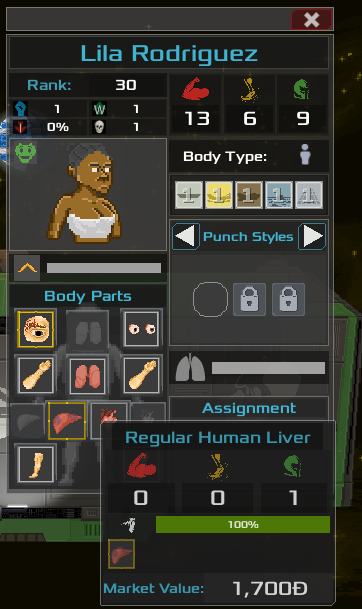 You could then use your shittier fighters as a ‘healing bags’ for damaged organs, while your prime slaves go back into the arena to earn you more credits. Another major change is that each injury inflicted on an organ will decrease its durability. Eventually the organs will wear out, and become ruined. This makes them more mechanically similar to equipment from an RPG, but it also fits better into the overall theme of humans being meatbags. Training in the game requires the use of training pods and trainers. 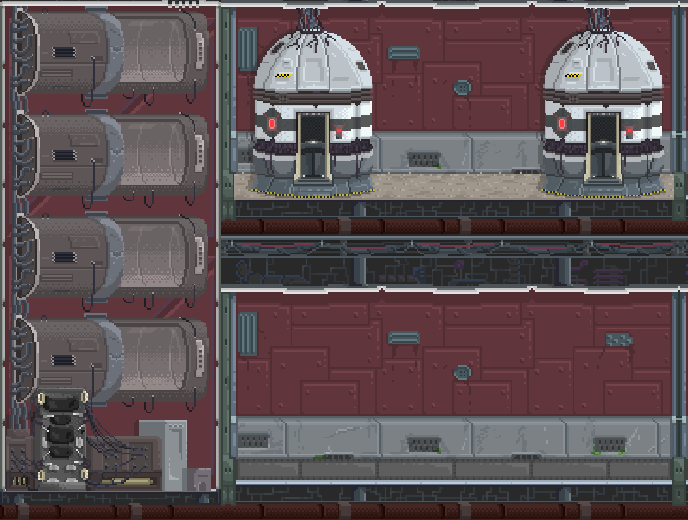 A trainer will monitor a room, which can contain 3 training pods, with 1 slave per pod. The terrain in each training room can be changed for a fee, but will give Slaves experience in fighting on that type of terrain. At the moment, there are 5 terrain types: Gravel, Sand, Mud, Water and a Steel-Grid. You can change the Fighting Style being taught in each room, with the Trainer’s individual skill deciding how quickly your Slave’s pick up the skill. Slaves can learn every fighting style in the game, but there are 5 levels in each style with each providing larger bonuses. There’s now a system which will eventually allow for player created mods. All fighting styles and attacks are stored in text files, which will appear inside the game’s folder. In turn, you’ll be able to create more of these and create new fighting styles and attacks, or rebalance the game as you see fit! It’s a relatively simple system for ingesting them into the game, but it works. The groundwork is there, and it needs some refinement, but I am super excited to make the game moddable! I Have further plans to expand this down the line, so that you’ll be able to create all kinds of new features. I’ll talk about those when I actually figure out how to make it work. That’s it for this DevLog! There are some major changes coming in the game, and I can’t wait to get them working and worth talking about. Lets talk about buying rival Slaver-Houses, making money from their work and getting fat from their profits! DevLog #2 - Injuries and Greenlight! Pit Fighter Tycoon has been Greenlit on Steam! To celebrate, I'm going to share some images & info about the horrific injuries your slaves can receive.